Developer Quote: "Are you up for the challenge to safely navigate your wizard through the Maze Magic in high definition?" Making your way through a real maze can be an entertaining and brain teasing activity. I always loved a maze of bushes as a child which was located in a popular theme park. I would run through the carefully carved 7' greenery trying to find my way out. 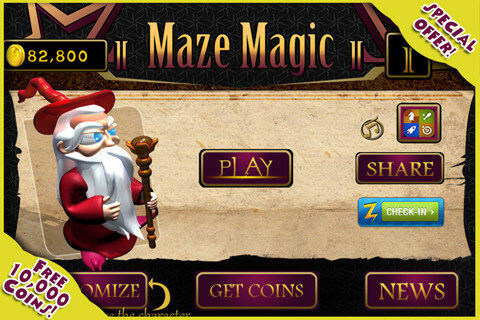 With Maze Magic, you get all of this fun plus a whole lot of obstacles, potions and spells thrown in! What is especially captivating about this iPhone puzzle maze is the use of 3D graphics throughout the game during 4 original stages with 40 varying levels. Just as in my real life maze, the game levels get more difficult the further you progress. 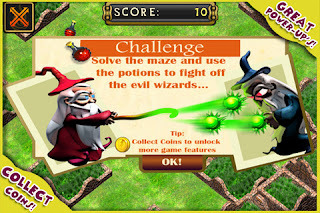 Your mission is to conquer the secret of the maze and also defeat the wizards with their evil spells. - Take on the Game Center leader board and see how you rate against other keen gamers! First of all, who doesn't like cute, little wizards? It's important to do a great job of making your way quickly and safely through the maze as your success will guarantee you coins. These unlock levels and allow you buy the powerups which help you survive. The sharp retina graphics and the clock ticking down make for an addicting and thrilling game with a bit of magic thrown in. COOL CONCLUSION: "Maze Magic is a spellbinding and charming game with twists and turns aplenty!" --Device: Universal: iPhone 3GS, iPhone 4, iPhone 4S, iPod touch (3rd generation), iPod touch (4th generation) and iPad.